The pier-head in the early 1970s showing the entrance fee of 6d. 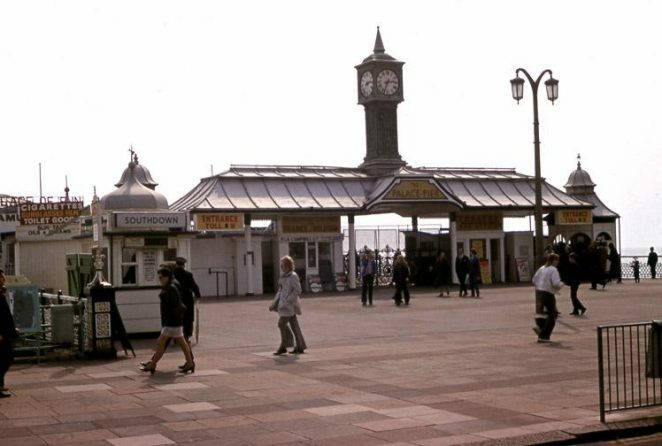 Does anyone have pictures of – or recall – or even been a client of – ‘Eva Petrulengo, Genuine Romany Clairvoyant’ who had a palm reading business in a small kiosk to the right of the Palace Pier entrance just before the toll booths? I seem to recall the kiosk being covered in stylised moons and planets as well as pictures of 1950s and 1960s celebrities who had consulted her (Elizabeth Taylor, Rock Hudson, maybe even Harold Wilson etc). Yes, I have been a client of Eva. She still reads palms. Hi Anon, can you let me know where Eva Petrulengo can be contcated or is located/works? Thanks. If the entrance fee of 6d is still showing, this must be VERY early 1970s. Before February 5th 1971 to be precise. Hello, I was a client of hers in 1988. I still recall the reading - still have it on tape. Would like to have a follow up on that reading. Is she still alive? Where does she do readings? Does anyone remember the tattoo artist who had a shop at the end of the pier? I had several tattoos done there. When he had no customers, he would lift up a floorboard and go fishing through the hole. I think his name was Bob. Happy times. I met my husband the night of August 8th 1970 and remembered going to see the bands playing along the front. Have just read Eva Petrulengo’s autobiography, out now in paperback. She is very much alive, I think she has her own web page. I think the book is called The Girl in the Gypsy Caravan. Does anyone know what happened to Patty, the owner of King’s Club? Does it still exist? I used to be a member of this club back in the ’70s during my studies. Great times! As any local resident from the 1970s will tell you, these pictures are not of Brighton Pier but of the PALACE Pier. Please, who was the artist who made the porthole coloured windows in the amusements hall? Thanks, regards Norman. I had loads of tattoos inked by Bob Bonwick on the Palace Pier back in the mid 70s and later at his shop in Coombe Terrace early 80s. His brother Alan was also a tattooist and had a shop at the top of North Road / Queens Road. Bob gave up tattooing mid 80s and was the landlord of The Bear pub – that was the last time I saw him. Still like the designs I picked to this day – a bit faded but they are 30 plus years old. My sons are into tattoos now only they are a lot more expensive but a lot better. Liked the tattoo scene better when it was more underground and exclusive. Eva Petulengro is my mother and still does readings. 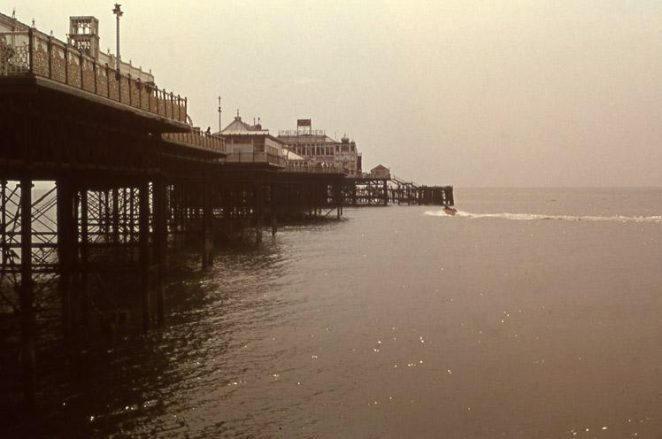 I’m glad that you brought attention to the fact that it’s Palace Pier in these photos, I’m sure that most born and bred Brightonians still refer to it under this name. I still call it the Palace Pier and I will never call it Brighton Pier because it’s not. 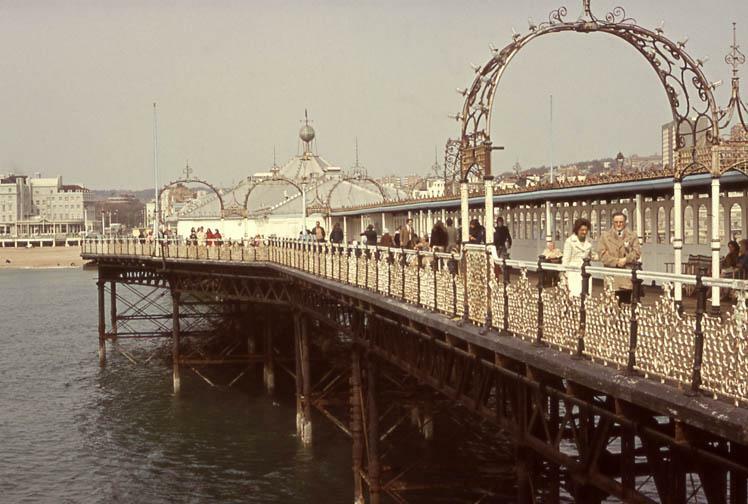 Brighton Pier is just a name dreamed up recently, the original was named Palace Pier by the person who built it! Someone should make a petition to get it back to its original name. Oh my goodness, such good memories. 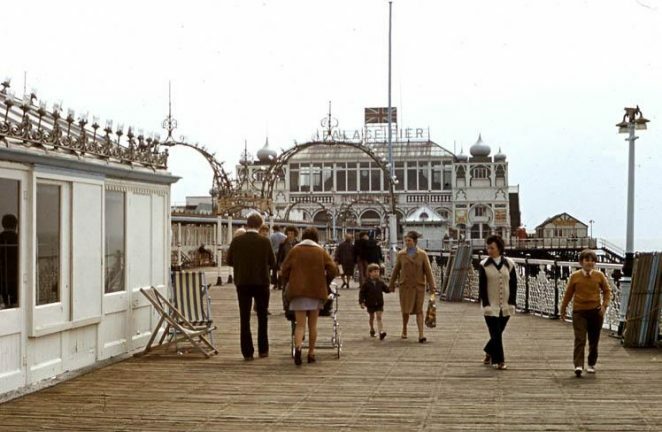 We had shops on the Palace Pier in the 70s. I loved every minute of the eight years we were there. Unfortunately Bob Bonwick died recently. Bob was a larger than life character who will be hard to replace, he was a loveable rogue. As every Brightonian knows, this is the Palace Pier. Many of the photos on this page are even captioned thus. So why does the page continue to be labelled Brighton Pier on this site? I was a mate of Bobs from the age of 15 when we started our first job together, him and his brother Alan would often experiment any tattoos on me ,with mixed results! In those days you needed a drink before you got it done ,and that included Bob ! …. RIP ..
Good point Alan Phillips, always will be THE PALACE PIER to Brighton folks. Got changed in the early-mid eighties when taken over by The Noble Group. My father-in-law was general manager prior to this buy-out but sadly passed away in 2013. 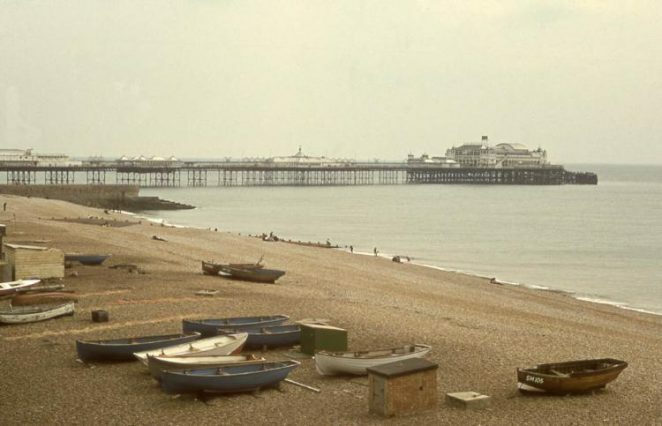 The barge incident actually caused the damage to the south end of the pier but to rebuilding the structure neccesitated removal of the theatre which was placed in storage. It then turns out that when the recovery was mooted some 4-5 years later that “The Noble Group” declared that the whole theatre structure had “conveniently” dissapeared from storage, never to be seen again. Probably sold off to collectors for a swift profit perhaps. Still that’s all water under the bridge (sorry) pier now. C’est la vie!